This weekend, I watched the first few minutes of the documentary "Blackfish". I had to stop at the part where Seaworld captured wild orcas and separated the babies from their mothers - the whole process makes me so angry! But other animals have learned to speak our language. Bonobos, for example, not only understand and speak English, they are advanced enough to hold conversations with us while hosting tea parties. 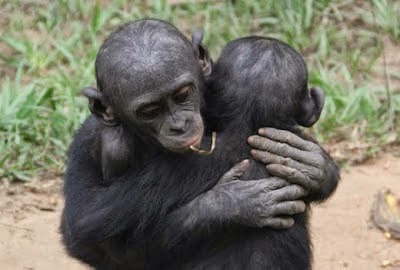 Chimpanzees and gorillas learned sign language and communicate just fine. Dolphins and whales also seem to understand us more that we understand them. Makes me wonder how smart humans really are.